In January 2017, Alexandre Bissonnette opened fire on a Quebec City mosque, killing half a dozen worshippers. Bissonnette held far-right, Islamophobic views. At trial, crown prosecutors presented evidence that he followed several right-wing and alt-right Twitter users, ranging from moderate voices like Fox's Bret Baier to overt racists like Richard Spencer. But the Twitter account he visited the most was that of Daily Wire founder Ben Shapiro. On this evidence, Shapiro now stands accused of "incitement" in a campaign launched by a singularly obsessed liberal millennial. I won't refer to him by name throughout this piece because he's very obviously the attention-seeking grifter type, and I have no intention of giving him the pleasure. Instead I will refer to him solely as Snotrag. 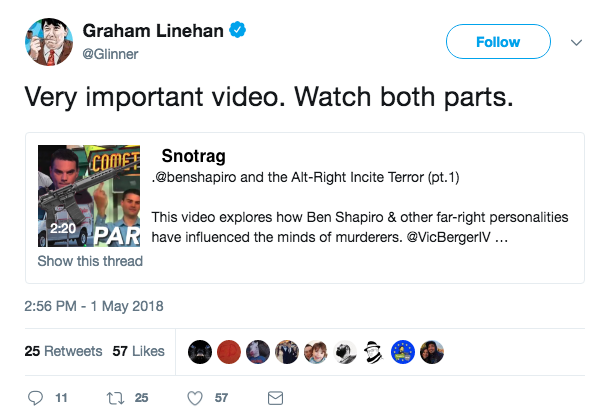 I'd be content to ignore Snotrag's campaign entirely, if it wasn't picking up steam among liberal journalists and celebrities (one even tweeted "#arrestbenshapiro," before deleting it). I'll be the first to allow that Ben Shapiro in the course of his career has said things about Muslims I disagree with, that cross the bounds of decency, and that are occasionally just false. If you want to criticize him, go hog-wild. But it's news to me that he has ever incited terrorist attacks, and if he did, I don't know how the Media Matters folks missed that one. 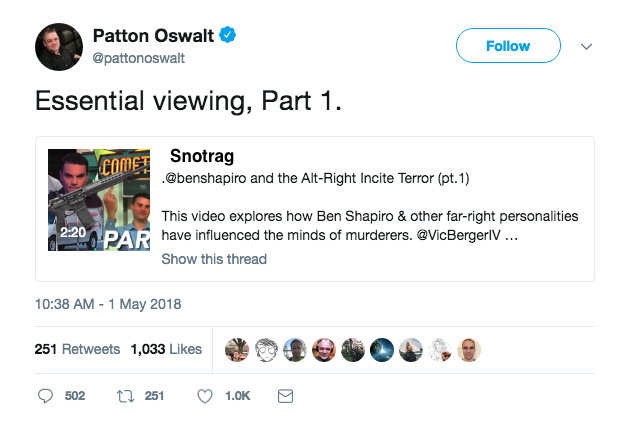 Snotrag's video cites a series of anti-Muslim and anti-Islam statements that Shapiro has made in his video, and there are a lot that are worthy of criticism (he jumped the gun and suggested the mosque shooting was Islamic terror attack, among other things). But Shapiro never calls on his followers to attack Muslims or radical Muslims. He never says Muslims deserve death. He simply never says says anything that rises to the legal or even moral threshold of incitement. 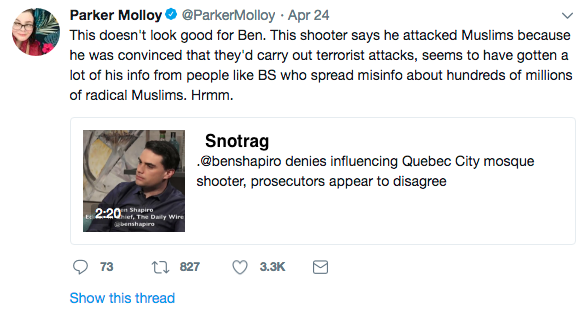 Some of the "incitement" statements cited by Snotrag are debatably just statement of facts, such Shapiro's claim that "most" Muslims are radicalized. That figure is heavily dependent on how you define radicalism. 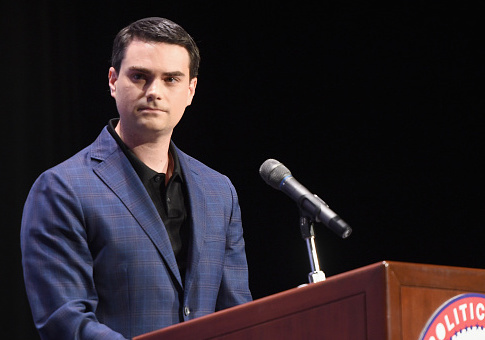 If you agree with Shapiro that supporting "making sharia the official law in their country" is "radical," 680 million and 72% of Muslims would be considered radicals. If you prefer Politifact's definition of support for violent terrorism, 182 million and around a fifth of Muslims are radicals. The only religious people I know of who celebrated 9/11 were radical Muslims and the leader of Barack Obama's church. That just strikes me as factually correct. Shapiro didn't claim that most or all Muslims cheered 9/11 (or that there were thousands celebrating in New Jersey). He said radical Muslims did. And they did. So short of any clear examples of calls for violence, Snotrag's argument appears to be the following. Ben Shapiro says things about Muslims that some consider hateful. One of Shapiro's 1.34 million Twitter followers attacked Muslims. 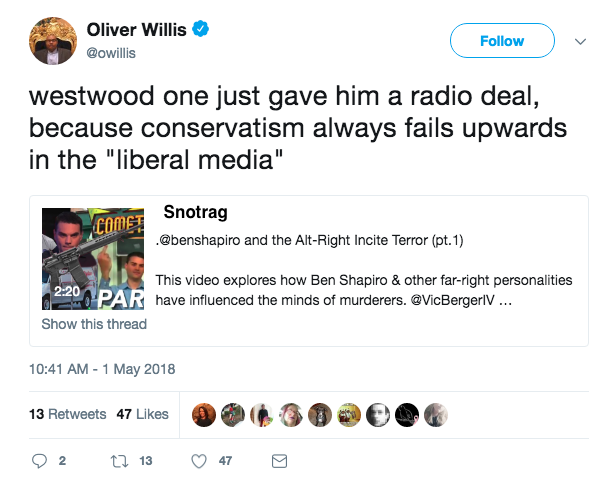 Ergo, Shapiro is guilty of "incitement." We see a similar line of thinking in a press release put out yesterday by gay rights organization GLAAD claiming Fox News host Tucker Carlson "incite[d] violence" against a gay activist. You can watch Carlson's segment yourself and see that he did nothing of the sort. He drew attention to the activist's absurd claim that Mike Pence wants to put gay people in concentration camps, mocked him for it, and then four of Carlson's 2.7 million viewers called for the activist's death on Twitter. This new paradigm would damn far more than just Shapiro and Carlson. Ample evidence suggests, for example, that the gunman who attacked Republican members of Congress last year was a massive fan of Bernie Sanders and Rachel Maddow and followed a number of liberal pundits and groups on Facebook. The Family Research Council shooter targeted the conservative Christian organization by picking them off a "hate map" put out by the Southern Poverty Law Center. The murderer of five Dallas police officers at a protest was a regular at Black Lives Matter rallies. Undoubtably all those people and groups have denounced their enemies in stark terms, casting them as hateful, destroyers of America, Russian agents, murderers, traitors, or the equivalent of Klan. But Sanders never called on anyone to pick up a gun, and Maddow has never encouraged violence. The Southern Poverty Law Center never called for vigilantism and the Black Lives Matter leadership never called for assassinations. It's absurd to accuse people and organizations with millions of followers of "incitement" when exactly one disturbed follower seems to have to picked up on the secret instruction to murder. This isn't some frivolous concern. Incitement is a crime. As with discussions surrounding "consent," attempts to expand the popular understanding of the term presages attempts to change the legal definition as well. When you convince people that certain speech is morally responsible for murder, it's only a matter of time before they demand the speaker be legally responsible as well. Already in many Western countries the definition of incitement has been expanded to embarrassing results, as in the United Kingdom where teaching your girlfriend's pug to Nazi salute as a prank is "incitement to racial hatred." The United States has been spared these indignities thanks to the strong protections of the First Amendment, but those protections last only as long as a popular will to uphold its principles exists. Call Shapiro a bigot if you so choose; feel free to criticize his rhetoric. But please ignore the Snotrags out there.